Rock n’ Shock with George Romero & The Walking Dead! Yesterday (Halloween) was more than just a horror fan’s favorite holiday. It also marked the premiere of AMC’s “The Walking Dead,” a series dedicated to one of horror’s favored sub genres – zombies! After the curfew of trick-or-treating had arrived, I eagerly set to the task of gathering up the kids’ costumes, straightening up the house, and sending the children to bed. By 9pm CST, Halloween’s “adult swim” had commenced at Fuentes house and I was ready to partake in this monumental occasion. I have to say that, judging by the show’s first episode, this has the potential for being a GREAT series! I really enjoyed it and thought that the actors were credible and the zombie effects well done. Since I have become disgruntled with TV’s “Supernatural” of late, it is nice to see another television series “arise” for us genre enthusiasts. 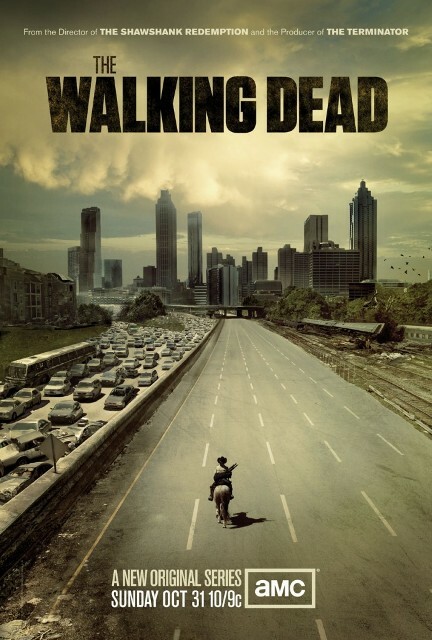 “The Walking Dead” was not without representation at the 2010 “Rock & Shock” convention. Signing photos while meeting potential fans was Melissa Cowan. Those who watched last night’s show will remember her as an unnamed member of the walking dead or, as in her case, crawling. Cowan’s zombie was seen dragging her dismembered torso across the grass, much to the horror of the now sufficiently traumatized, Officer Grimes. Cowan, herself, was quiet yet pleasant. I believe it is safe to say that she is a genre fan as well since moments before our meeting she had visited the table of THE EXORCIST’s Eileen Dietz for a fan photo. A world overrun by the undead is an idea we can all credit to the “Godfather of Zombies” himself, George Romero! It was fitting that we met Cowan soon after communing with him. Having accomplished the majority of our set goals at “Rock & Shock,” there was no longer any excuse in evading his long line. I assured Romero that he was WELL worth the wait while again telling him how big a fan I am of his work. I posed for another photo, this time utilizing a “brain” I had purchased from our friend at The Gemini Company. This was David’s first meeting with Romero and he was amazed how fan-friendly he was. David talked with Romero a bit but, due to the ever-growing line behind us, had to keep it brief. Both of us were under the impression that, had time allowed, Romero would have had no trouble talking about his films a great deal more. 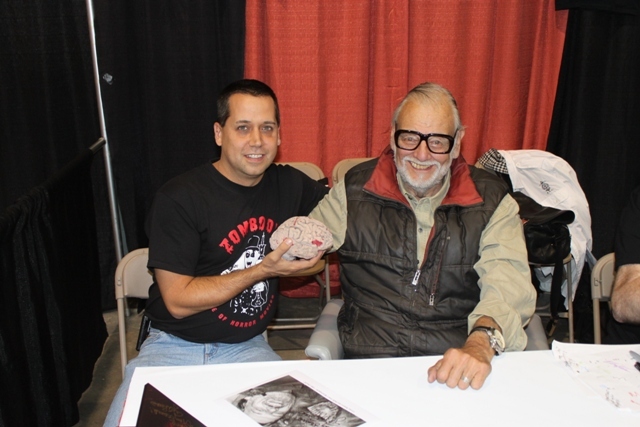 As we parted from Romero he continued issuing apologies to me about the time I spent in line to see him at Horrorhound. As if! Romero has more than deserved his following and, although the premiere of “The Walking Dead” beat out many of his latest zombie entries, one can not appreciate one without the other! 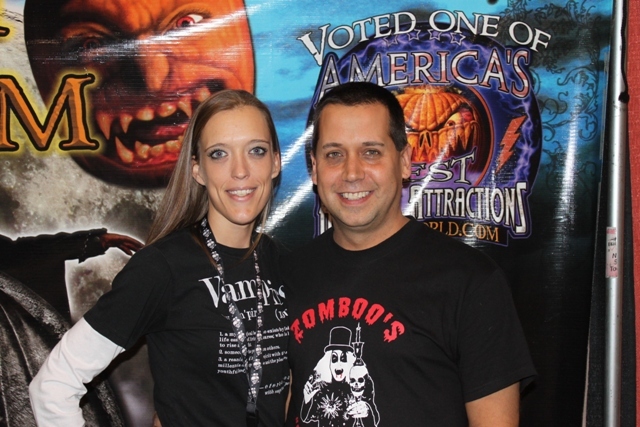 This entry was posted in Celebrity Encounters!, Convention & Expos and tagged 28 Days Later, Eileen Dietz, George Romero, HORRORHOUND WEEKEND, Melissa Cowan, ROCK N SHOCK, The Exorcist, The Gemini Company, THE WALKING DEAD, Zombies. Bookmark the permalink. ← Mercyful Fate! Horror Host Sinister Minister channels King Diamond! 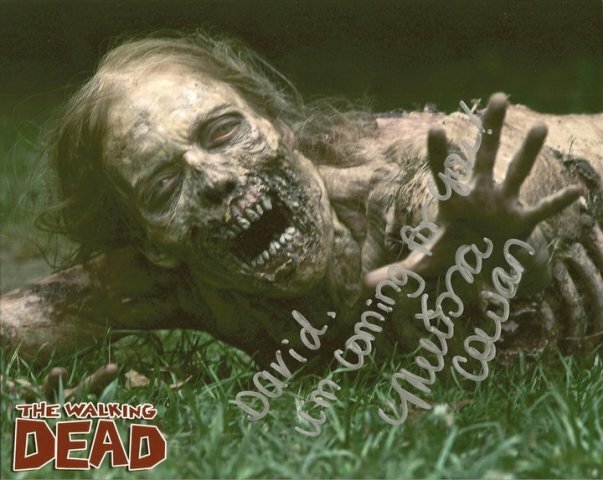 Did George A Romero have any thing to do with the walking dead? Did he at least have a pass to be on set?